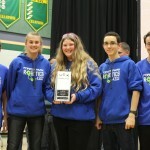 At the Bull Run Regional, 4303C won the Excellence Award along with Programming and Robot Skills! Team 4303X finished in the top 8 after qualifiers and hit a personal best in robot skills. Congratulations Teams! Congratulations to 4303X and 4303C who finished in 7th and 8th place after the qualifying rounds at the Battle of the Bridge at Woodbridge High School. Team 4303C went on to become the Tournament Champions with a stunning win over the top ranked alliance in the finals 205-203! October 31st – Congratulations to 4303C for their performance at the Potomac School Regional. 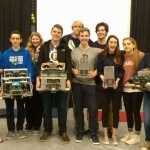 They won the Robot Skills Challenge with 201 points! They are currently the top ranked team in Virginia. The 2015-2016 season is off to a great start! We had a incredible turnout to our information meeting. Our team has tripled in size from last year, we now have 6 teams competing this year. It’s going to be a great year! SeaPerch National Championship – Team Crossfire finished in 11th place overall! © 2019 Forest Park Robotics.